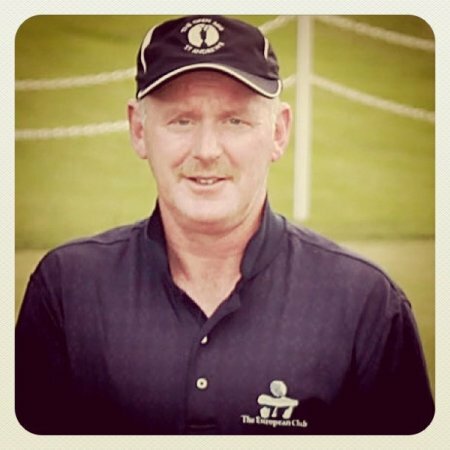 His three over par effort saw him slip back to one over par at Pestana Golf Resort’s Vale da Pinta course in Portugal while Ulsterman Jimmy Heggarty is tied 29th on six over after a third round 75. Austria’s Gordon Manson will take a two stroke advantage into the final round after a battling two under par 69 in tough conditions. The Scottish born 50 year old, who plays under the Austrian flag after moving there in 1984, was one of only four players to break par in round three. Only Manson and Chilean Angel Fernandez, who also signed for a 69, posted rounds in the 60s as morning rain and wind claimed a number of victims. 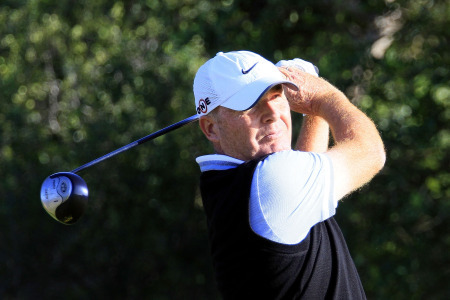 Manson boosted his chances of securing playing rights for the 2011 Senior Tour season with a fine eagle on the par four 11th, holing his nine iron approach shot from 122 yards. That came after birdies on the first and tenth holes, with bogeys on the third and eighth holes sandwiched in between. A run of seven consecutive pars on the way in kept him on five under par, two strokes clear of American Tim Thelen who recovered after dropping four shots on the front nine to card a 71. “The eagle on the 11th was something special,” said Manson. “I thought it was going to be close but it went straight down the can. “I then played really well for the next seven holes. Conditions were tough today so two under was a good score. It was the first time the wind has really blown since we’ve been out here and it changed everything. Former Challenge Tour winner Manson grew up in Scarborough, in the north east of England, and said that foundation had helped him in the wind, as he looks for a return to Tour life following an absence of nearly 20 years. “I do rate myself as a decent player in the wind having learned the game in the north east of England and that certainly helped me today,” he said. “I played on The European Tour in the 1980s and then again in the 1990s after winning on the Challenge Tour but I’ve been coaching in Austria for the last 24 years. I fancy giving it another go on Tour now though. Thelen, who led the qualifiers from First Stage at Pestana’s Gramacho course, birdied the last hole to maintain his impressive challenge so far. The former college colleague of Colin Montgomerie had endured a difficult front nine, double bogeying the fourth hole and dropping further shots on the fifth and ninth holes. He hit back strongly with three birdies on the back nine to move back to three under par. One shot further back is Australian Graham Banister, who chipped in from the edge of the green to card a round of 74 after also double bogeying the fourth hole. Overnight leader Steve Van Vuuren, of South Africa, signed for a round of 76 to lie fourth shots off the pace on one under par in a share of fourth place with Swede Peter Dahlberg (73), Fernandez (69), and Spaniard Manuel Moreno (72). With positions one to six gaining full playing rights for 2011, all four will be hoping for a stronger showing in the final round to join players such as Sam Torrance and Ian Woosnam on the Senior Tour next season. A minimum of eight further alternate cards will also be available. Among those currently occupying the top 14 positions are two amateurs – Irishman Errity and François Illouz of France, who carded three double bogeys and five bogeys in his eventful round of 73. Until today, Pat Errity’s biggest claim to fame was that he took Padraig Harrington to the 15th in the quarter-finals of the 1994 Irish Amateur Close Championship at Portmarnock.